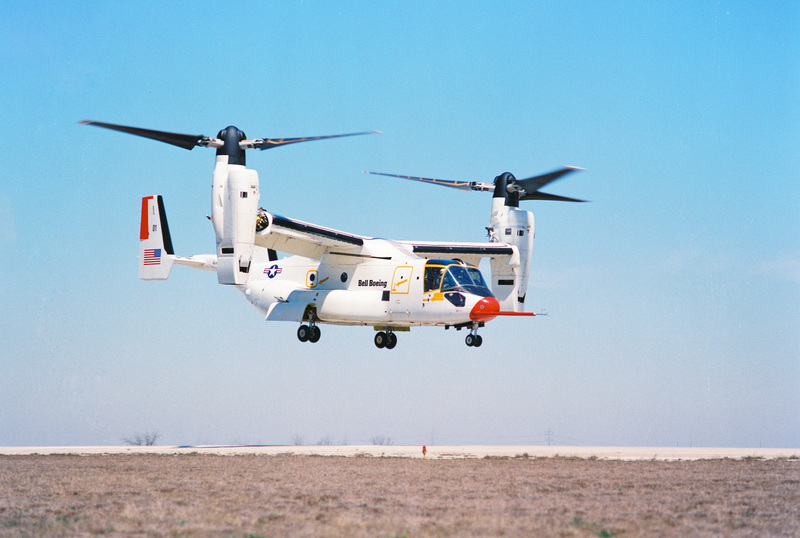 An early V-22 test flight. Bell-Boeing photo. Military and industry officials gathered at the Marine Corps Museum in Virginia on Tuesday to celebrate the 30th anniversary of the Bell-Boeing V-22 Osprey’s first flight and to welcome in the next era of V-22 operations around the globe. Chris Gehler, Bell’s vice president for V-22 and the deputy director of the Bell-Boeing V-22 joint venture, told USNI News to day that the program recently reached 450,000 flight hours and built its 375th aircraft and is about to begin operations in the third military service, as the Navy looks to accept its first CMV-22B in Fiscal Year 2020 and begin operations in 2021. “The airplane’s been doing quote a lot. It’s deployed around the world, it’s the most sought-after aircraft by combatant commanders who want to know exactly where all the V-22s are so that they can be ready if there is an issue, whether it’s humanitarian or other,” Gehler said. On the Navy side of the portfolio, the CMV-22B will replace the C-2A Greyhound as the carrier onboard delivery (COD) platform that will ferry people, supplies, mail and more to and from the aircraft carriers at sea. 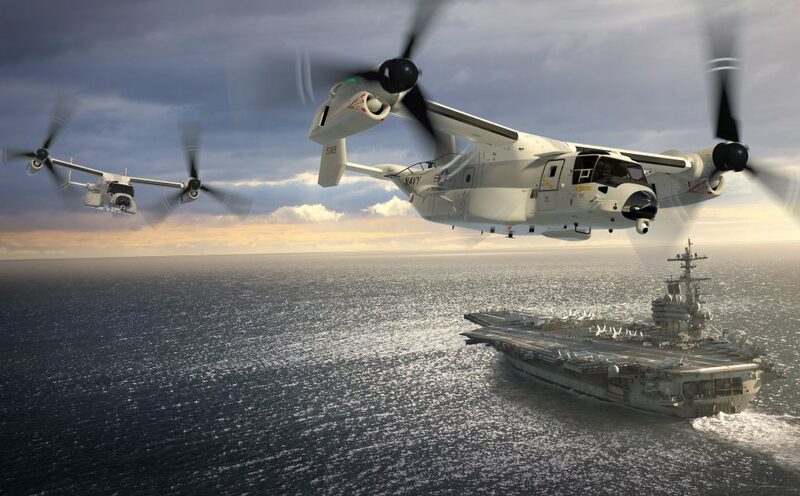 However, due to the V-22’s vertical takeoff and landing capabilities, the Navy will be able to operate the new COD from other ships like destroyers and Military Sealift Command support ships, so whereas the fixed-wing C-2A forced a hub-and-spoke model of movement, the CMV-22B could allow a more efficient distribution of people and goods throughout the carrier strike group. 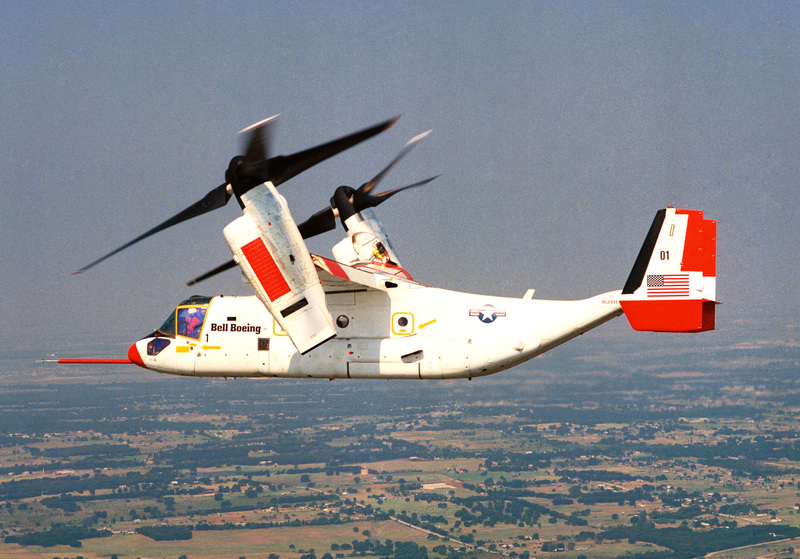 The variant takes the baseline V-22 and adds sponson fuel cells on the wing to achieve greater fuel capacity and therefore greater range – 1,150 nautical miles. It also adds a public address system in the back for passengers and a high-frequency beyond line of sight radio. “The CMV is in production now, with a couple of fuselages at the Boeing plant in Philly, and those will … move down to Amarillo to be finished out later this year,” Gehler said, noting that the first aircraft will go through Navy-specific testing and the remainder will deliver to the fleet to begin training and operations. On the Marine Corps’ current inventory, a Common Configuration-Readiness and Modernization (CC-RAM) program seeks to take about 77 configurations of the aircraft and reduce that down to five. Gehler said the Marines were eager to take the aircraft straight from the production line and send them to warzones in Iraq and Afghanistan, and enhancements to survivability and capability were added into the production line as they were engineered to give the Marines the best aircraft possible. As a result, though, each aircraft that a maintainer works on may be configured slightly differently than the last, slowing down repairs and complicating the supply chain. The CC-RAM effort “is to improve maintainability on the flight line, where fleet Marines see the same airplane basically rather than a unique aircraft every time they come up to it. That will improve the logistics tail as well as maintainability. That’s the intent and purpose of the CC-RAM, there will be a readiness improvement because of it,” Gehler said. The first few aircraft are at Boeing’s facility in Philadelphia now for the CC-RAM upgrade, and the service hopes to eventually upgrade at least nine a year and potentially as many as 24 a year, depending on available funding. 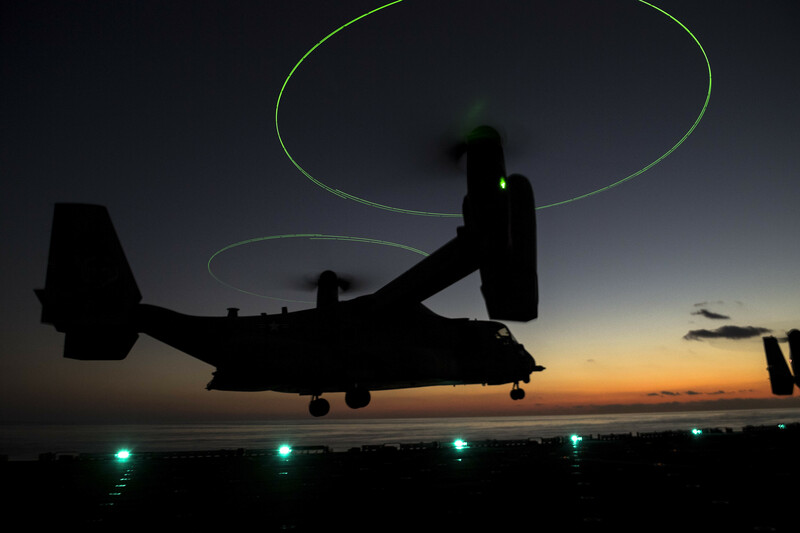 Just behind the CC-RAM effort is a nacelle improvement effort that could achieve 10-percent greater readiness for the V-22 fleet in the Marine Corps and Air Force. About 50-percent of maintenance time is spent on the nacelles at the end of the aircraft wings that house the engines, gears and wiring that move the propellers from their vertical helicopter mode to the forward-facing airplane mode. Gehler said the middle portion of the nacelle is “where all the tiltrotor magic happens” and requires a lot of maintenance. The upgraded nacelle will have a new structure; new wiring that is more reliable and easier to repair when needed; fewer wiring interface boxes, going from 10 to two; and more space to move around hands and tools and to visibly check components during maintenance checks. All Marine Corps and Air Force aircraft will be backfit with the new nacelles, and while the first few Navy aircraft will be built with the old design due to the timing of getting the new design to the production line, “we’d certainly like to get the first Navy aircraft that miss that through the line as quickly as possible so that [the Navy is] starting their floats and their journey with the V-22 with the best possible aircraft and the greatest maintainability that they can, greatest readiness that they can,” Gehler said. Previous efforts to upgrade the aircraft focused on new capabilities, such as adding an aerial refueling capability to the aircraft. Now, though, Gehler said, the military’s main focus is maintainability and readiness – though conversations may soon shift now that these two major readiness-focused efforts are underway. “The focus – and this is not just on the V-22, but certainly within DoD, the Navy and the Air Force – the immediate focus is on readiness and everything that we can do to drive readiness into the platform and improve that so that these platforms are ready for the servicemen and women who need them to use to support combatant commanders,” Gehler said. Of course, no reflection on the 30-year history of the V-22 program could ignore safety – after the first successful flight on March 19, 1989, multiple subsequent flights during operational testing proved deadly. A 1992 crash killed seven, an April 2000 crash killed 19 Marines, and a December 2000 crash killed four. Gehler said the Bell-Boeing team maintains a “daily focus” on safety to this day, though the V-22 now has a better safety record than many military aircraft and is widely relied on throughout the fleet for safe and reliable transport of troops and gear. “As an aviation company – both Bell and Boeing and the Bell-Boeing partnership here that produces V-22 – safety is paramount. Safety is embedded in everything we do, and I think the procedures we have, in our engineering and our design checks, in our quality assurance that we do … is all about putting the safest product out there, especially for our servicemen and women around the world,” he said.